KNOXVILLE, TN — The meetings last only two hours. They begin with tours of facilities offering different types of housing and refreshments to break the ice and set the mood for the one meeting focus: affordable housing. The panelist as well as the audience have been changing as the town hall meetings are moving about the city. There have been two meetings in the last two months; one on the east side in the inner city – the other in North Knoxville. Attendees stretch across a wide spectrum of Knoxville. Along with the citizens of Knoxville; former council members, commissioners, candidates running for city mayor in 2019, and pastors and board of education members have been a part of the audiences waiting to hear what the citizens want and learning what is available. The meetings are orderly – Mr. Hubert Smith who has moderated the first two meetings has made sure of that. All questions are submitted on an index card. The questions come from the audience and from questions received from the public via a survey that has been placed around the city. The questions are answered by the members of the panel who are involved with affordable housing needs of the people in Knoxville. The panelist and the questions submitted are revealing the “face” of affordable housing. The North panel represented a wide range of the citizenry of Knoxville. Considered experts in their fields; they openly shared the housing struggles of the people they represent – revealing facts and dispelling myths. Those who spoke at the north meeting were: Katrice Thompson, Family Justice Center, Shawn Griffith, Executive and Chair Knoxville Homeless Youth Council, a part of the Knox County Homeless Coalition, Mrs. Deni Kidd, author of “In Her Threads” and Director of Missions of Light and A21, both organizations which serve trafficking victims and refugee needs. Also serving on the panel were Silivia Calzadilla, First Director Centro Hispano de East Tennessee and advocate for the Hispanic population for over 34 years, and Seema Singh-Perez, city council woman who has also been an advocate for over 20 years in the areas of medical social work, the homeless population and needs of women and those with HIV/AIDS. Who the different people are, what their needs and desires are for housing are shared among the audience and the panelist. Each panel takes on a life of its on. 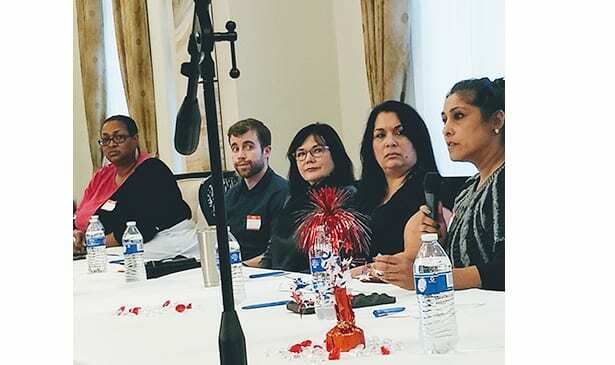 The east meeting revealed needs of homeless, veterans, single moms, those with addictions, aged out youth, grandparents raising children and the needs of those released from jails and prisons. The North meeting revealed concerns about housing for immigrants, Hispanic and other ethnic populations, housing for those abused and trafficked, youth under the age of 18 and those housing needs for young people ages 18 to 22. There was also discussion about ways to extend care for youths aging out of foster care.The panelist were very knowledgeable and shared resources with the audience after the meeting as has become the pattern for the meetings which end promptly after two hours. The future meetings will deal with more faces of affordable housing which have already been revealed from surveys received. Among the issues to be discussed are: addiction housing needs, emergency housing and shelters, NIMBY and YIMBY issues (Not in my back yard and Yes in my back yard), faith based organizations and their role in housing, more supportive housing for the mentally ill and chronic homeless, needs and concerns of landlords and developers, and realtors who can help with housing needs. The next meeting will be held in South Knoxville, Saturday, November 17th at Flenniken Landing, 115 Flenniken Ave Knox Tn 37920. The meeting will begin with a tour of the facility from 2 till 230 with the meeting beginning at 245pm. The West meeting will be on Dec 1st with the final wrap up meeting held at the city county building in the assembly room on December 14th. The town hall meetings are free and open to the public. They are being co-sponsored by City Council woman Seema Singh-Perez and I AM The Voice of the Voiceless, a non profit organization that advocates for the at risk population.